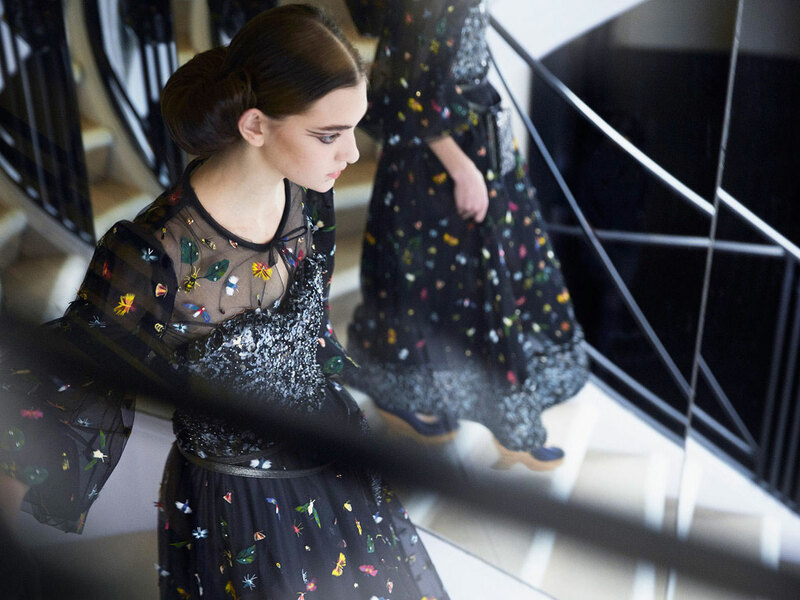 Karl Legerfeld created a designer dollhouse at the glass-roofed Grand Palais in Paris earlier this week to display the Chanel Spring 2016 Couture collection as part of Paris Fashion Week. The runway was a serene oasis of geometric green lawn (real grass, of course) with a backdrop of leafy trees (real), floating lily ponds, and blue sky (painted—even Karl can’t command everything) which was in stark contrast to last October’s bustling airport terminal installation for the Spring 2016 Ready-to-Wear show. This time out, Legerfeld has taken note of nature and set it amidst the artifice of haute couture. Leave it to Karl to make it brilliant. The 82-year-old head designer and creative director of the French luxury brand took an eco-conscious approach to Spring fashion. Fabrics were embroidered with wood panels, small wood tiles,wood shavings, wood fragments, wood sequins and wood pearls (yes, really); materials included “wild cotton,” cork, linen, hemp, raffia, and recycled paper straw; garments were patterned with flowers, birds, and accented with bejewelled bees—a recurring motif—adorning everything from ears to lapels to phone pouches. It was a dreamy, ethereal display of nature re-imagined. Lagerfeld described the aesthetic as high-fashion ecology. We just call it gorgeous. The collection was a ode to beige. Variations on the neutral palette included ecru, taupe, sand, straw, putty, and mocha. 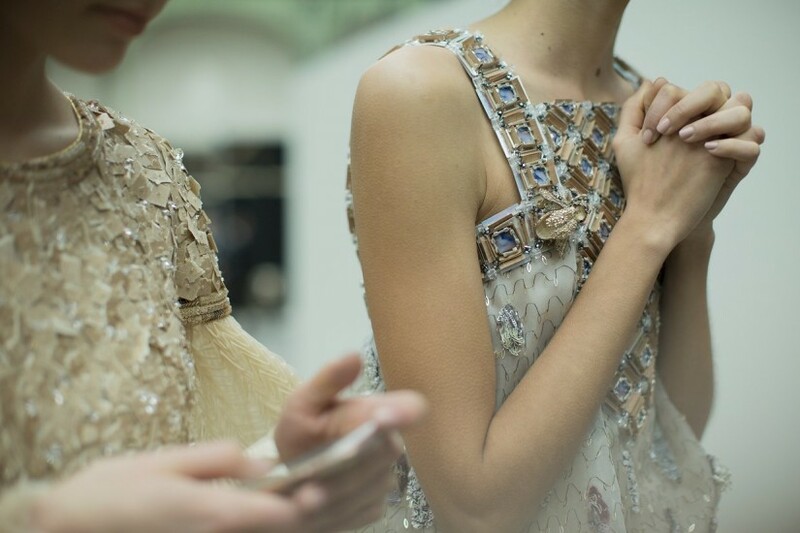 “Gabrielle Chanel was the Queen of Beige”, explains Karl Lagerfeld. “Beige is one of the most versatile neutral tones. 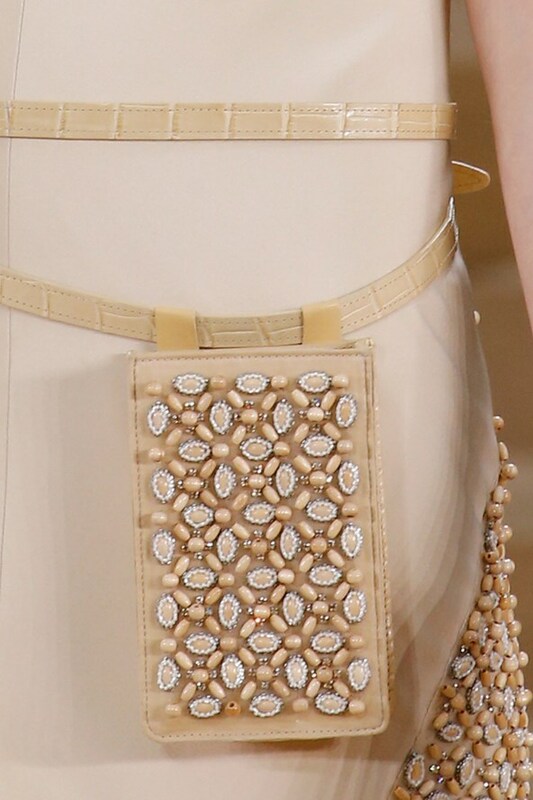 It offers a perfect balance between the warmth of brown and the freshness of white.” (Chanel News). Mademoiselle Chanel employed the shade in her collections for her jersey pyjamas, her tweed suits, and her shoes. She also created a lasting style statement by combining it with black that has continued to typify the label to this day. Lagerfeld’s emphasis was on silhouette: the line was long and elegant. There was a strong focus on the Chanel suit; the bouclé jackets were neatly fitted with a voluminous rounded sleeve and set-away collars tapering to mid-calf pencil skirts or paired with skirts of varying silhouettes. Sharp contrasts were also in evidence as in the classic navy and white combination. Cocktail dresses were, naturally, black. After all, Coco Chanel was also the Queen of the Liitle Black Dress. We had to make everything because those – there are no sequins in wood and pieces like this and straw and things… We had to make everything. Normally, they make the embroidery with existing material. We had to create the material because those things don’t exist. 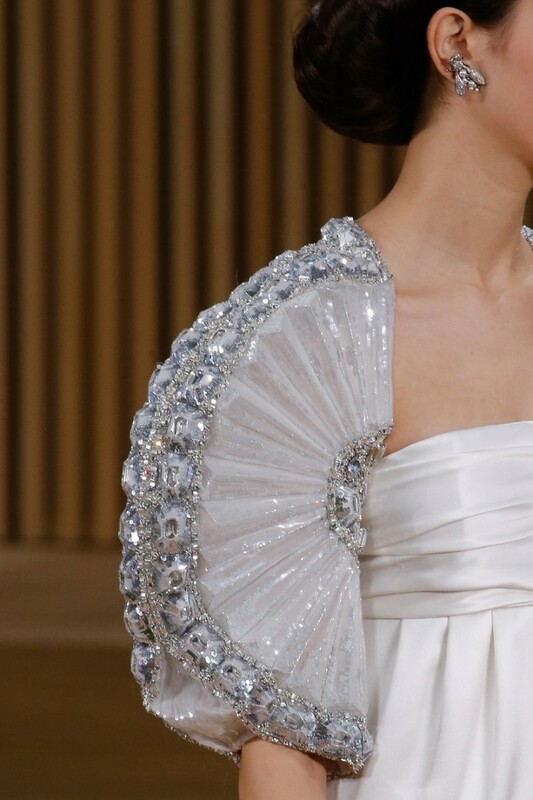 There was a wonderment of sheer panelling, shoulder cut-outs, appliqués, magnificent capes that were painted and embellished, geometric lace and textured embroidery in rhinestones or beading that recalled the intricate and ordered patterns of nature. In short, the collection was a marvel. Shoes took the shape of a satin two-tone ballet pump atop a cork wedge. This is our new bag (…), identical to those used by 15th century ladies of the manor to carry their keys; any other accessory would be too much. We are not sure what the tote-bag carrying crowd are going to make of this. I’m all for it, as long as I can fit a lipstick in it. Make-up artist, Tom Pecheux, showcased soft, minimal, and fresh make-up which created a neutral counterpoint to the focal Cleopatra-esque kohl-black swirls embellishing their eyes. The sleekly sophisticated “Chanel croissant” hair, created (and so named (#chanelcroissant) by Sam McKnight, was whimsical yet modern; subtle yet dramatically extreme. The low updo was inspired by Pablo Picasso’s 1932 sculpture, Head of a Woman, which Lagerfeld showed to the hair stylist from his phone, and McKnight then spent five full days creating and fitting the oversized hair pieces. 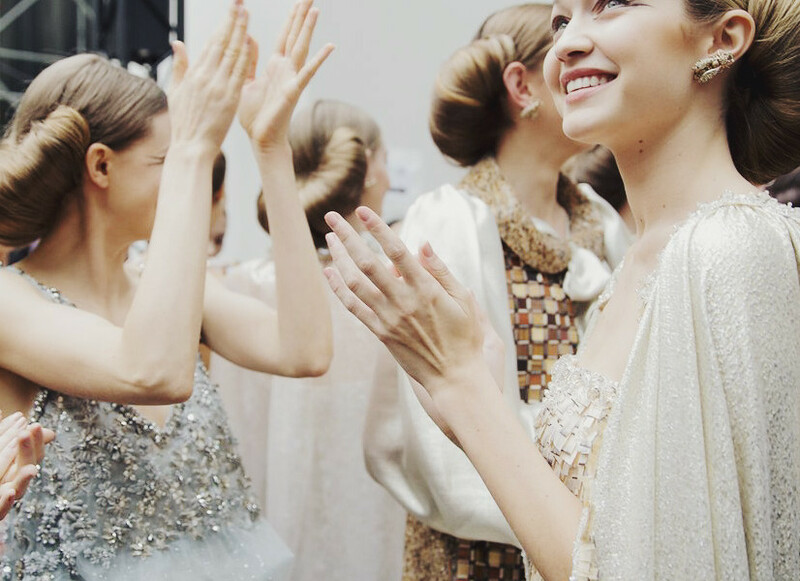 Couture has often been criticized and dismissed as being a frivolity for the super-rich, but considered from an ecological perspective, perhaps it suddenly makes sense; or perhaps, its time has come. After all, it is crafted by artisans, made by hand, takes infinite hours of labour, and potentially lasts a lifetime. It is the very antithesis of fashion’s notoriously fast-changing and disposable nature. 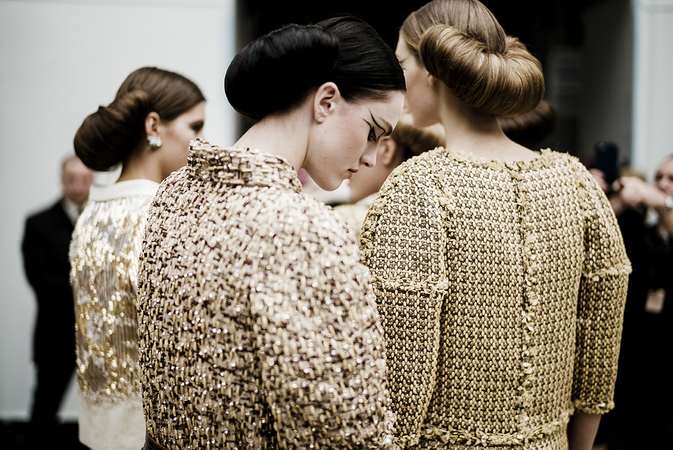 Perhaps the Chanel spring couture show was a meditation on the timelessness of not only nature, but of style as well. All whilst giving the nod to the enduring Chanel ethos, and to its founder, The Queen of Beige, Gabrielle Chanel, who asserted, Fashion fades, only style remains the same. That Lagerfeld chose the bee as a prevailing symbol for his Spring 2016 show is richly symbolic—the bee denotes renewal, happiness, and industry. How fitting. Bravo, to the House of Chanel! View the entire Chanel collection (here); Instagram (here); Chanel website (here); Sam McKnight (website, Instagram); Tom Pecheux (Instagram, Twitter). Post Photo: By Douglas Kirkland, 1962.